Over the past twenty or thirty years, a great ecumenical push has occurred where many so-called “evangelical” pastors and leaders have partnered with the Vatican, the Pope, Bishops, or local priests in spiritual endeavors. 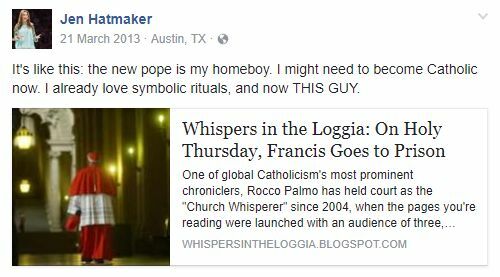 These men and women have called the Pope a brother, have blurred the doctrinal lines between us, and have betrayed the faith. This ecumenical move has occurred at the global, national, and local level. After so many years, nearly a generation, people are now used to evangelical leaders accepting and promoting the Catholic Church to varying degrees. Some say that we can partner with the Catholic Church on social endeavors, such as being against abortion, for traditional marriage, or helping the poor. (Russell Moore). Others say outright that the Catholic Church is Christian, just another “stream” of Christianity and we can and should and do borrow heavily from them in teaching our local congregations. (Tim Keller). Whether one has gotten on the continuum and partnered with the Roman Catholic Church in a hold your nose, social justice only gingerly sort of way, or is all-in with promoting the RCC as Christian (and thus not a mission field) doing so is wrong and unbiblical. The Catholic Church teaches a different Gospel, a different Jesus, and holds to many unbiblical practices. It is a counterfeit religion that has nothing to do with our Lord. Do not be unequally yoked with unbelievers. For what partnership has righteousness with lawlessness? Or what fellowship has light with darkness? (2 Corinthians 6:14). We are to make a distinction between the true faith and the counterfeit. Failing to do so fails the commands of Jesus to be a people set apart, and tragically erases an entire mission field from existence. And by that will we have been sanctified through the offering of the body of Jesus Christ once for all. (Hebrews 10:10, sanctified means set apart). But you are a chosen race, a royal priesthood, a holy nation, a people for his own possession, that you may proclaim the excellencies of him who called you out of darkness into his marvelous light. (1 Peter 2:9). Yet the ecumenical push continues and in fact has made inroads 30 years later. Ravi Zacharias, the world’s most well-known Christian apologist, refuses to draw a line around fundamental and essential doctrines and exclude the RCC. Beth Moore has taught that the RCC is another denomination and also has taught some Catholic Mystical practices. I was talking with my sister yesterday who is struggling with explaining her view of grace to her friend that is Catholic and wants to know. I told her, we are all just doing the best we can to know and understand God with what we have- our individual views of Him will always be growing and changing as we wrestle through scripture and life. “Our individual views of Him”? No explaining the Gospel? No drawing distinctive lines between the true faith and the false deception of Catholicism? No explanation of grace by faith alone and not salvation by sacraments, tradition, and wrongly interpreted scriptures? Scriptures that were withheld from people for 1000 years before Tyndale translated and unleashed it? A woman whose template for spiritual gatherings and holy conversations is currently used at this many gatherings in the US alone? The article over which she was gushing was that the Pope was headed to a prison where, in front of cameras, he will wash 12 inmates’ feet. She makes the deep gulf between the Catholic and the Protestant seem like a joyful jump over to where ministry is cool and rituals and symbols are fun, not actually blasphemous as they are. Does she forget that millions of faithful evangelical, Protestant pastors preach the true word, minister, and love in the face of criticism and persecution, daily? With nary a camera in sight? What about gushing over those guys? “Pope Francis is the perfect example of authenticity and humility. 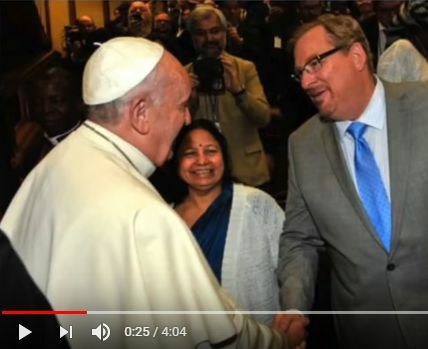 He is doing everything right.” Warren then referred to Pope Francis as “our new pope.” ~Rick Warren, ‘Evangelical’ pastor at Saddleback Church. Rick Warren believes the Reformation was a mistake and a new reformation will eventually bring us all back together. “The first Reformation actually split Christianity into dozens and then hundreds of different segments. I think this one is actually going to bring them together… Last week I spoke to 4,000 pastors at my church who came from over 100 denominations in over 50 countries….We had Catholic priests, we had Pentecostal ministers, we had Lutheran bishops, we had Anglican bishops, we had Baptist preachers.” Source Rick Warren, The Pew Forum on Religion & Public Life, 2005. What the Reformation did was divide those who believed in the Gospel of Jesus Christ from those of Rome perpetuating a false Gospel of works. And again, Catholicism is not a Christian “denomination.” It is an apostate religion of satan. Why Rick Warren is important to cite: His church is one of the top 50 megachurches in the US, In 2008 he was invited to give the Inaugural Prayer at the President’s swearing-in and introduced to the world as “America’s Pastor”, and his book Purpose Driven Life was on the bestseller list for 90 weeks and has sold 60 million copies. Why is Osteen important to cite? 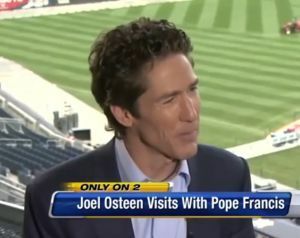 Lakewood Church has an average weekly attendance of 52,000, and Osteen’s sermons are also televised in more than 100 countries, with an estimated 7 million viewers each week. 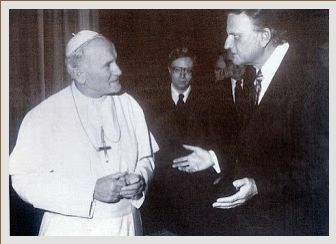 The visit of Pope Paul II to the United States is an event of great significance not only for Roman Catholics, but for all Americans – as well as the world… In the short time he has been Pope, John Paul II has become the moral leader of the world. My prayers and the prayer of countless other Protestants will be with him as he makes his journey. Why is Billy Graham important to cite? He has been THE face of Christianity since 1949, his first Crusade. The first Crusade to be broadcast on television was in 1957, and anyone growing up in the latter half of the twentieth-century will have seen the preacher preaching in Crusade after Crusade. Sadly, he would only compromise Jesus’ Gospel later by forming alliances with Rome, and by denying the exclusivity of Jesus as the only way to salvation. Warren, Graham, Keller, Hatmaker, Allen, Moore, among many others who should know better, don’t care that thousands of God’s people were murdered by the Catholic Church for daring to preach the true Gospel and express faith in the resurrected Jesus, a Jesus who is the only Head of the Church. These men and women, and many others I did not cite, are blaspheming against the finished work of Christ. The doctrinal lines are wide and they run deep. The divide between Catholic and Protestant is eternal and permanent. Thousands of martyrs died to preserve that line, while always inviting and preaching to those on the side of the looming punishment. Unity with falsity doesn’t save. Wiping away the lines of 500 years of blood and persecution by the very church with which they want to unite is perverted and gross. Lest you think I am too harsh, see what one of very many preachers have said about Rome in their assertion that we must never, ever compromise the Reformation’s values again. Here is Charles Spurgeon in 1864, from his sermon refuting Baptismal Regeneration (something Billy Graham believes in). It is a most fearful fact, that in no age since the Reformation has Popery made such fearful strides in England as during the last few years. I had comfortably believed that Popery was only feeding itself upon foreign subscriptions, upon a few titled perverts, and imported monks and nuns. I dreamed that its progress was not real. In fact, I have often smiled at the alarm of many of my brethren at the progress of Popery. But, my dear friends, we have been mistaken, grievously mistaken. It really is an alarming matter to see so many of our countrymen going off to that superstition which as a nation we once rejected, and which it was supposed we should never again receive. I have but to open my eyes a little to foresee ROMANISM rampant everywhere in the future, since its germs are spreading everywhere in the present. I see this coming up everywhere – a belief in ceremony, a resting in ceremony, a veneration for alters, fonts, and Churches – a veneration so profound that we must not venture upon a remark, or straightway of sinners we are chief. Here is the essence and soul of Popery, peeping up under the garb of a decent respect for sacred things. What would Spurgeon make of today’s evangelical leaders and their acceptance of Rome? No, we need the Reformation. It still matters. Good post. I encourage you to keep up your defense of the truth in these cloudy days. Most evangelicals have no clue what Roman Catholicism actually teaches. And they don’t really know what the Reformation was about. One friend of mine confuses the Reformation with Vatican II.